Thanks, but no thanks, Amber Rudd! It has been only a matter of weeks since Amber Rudd, the UK Energy Secretary, announced that the UK would be making a ‘Dash for Gas’, with the strategic priorities in energy being focused on Fracking and Nuclear. At the same time, she also announced a new ‘Shale Wealth Fund’ that will essentially be used to bribe communities in to supporting fracking in their area. This announcement may well, in the future, be recorded as a historic failure of our Government to address the issues prevalent in our energy system and, worse, to make the required changes necessary to address Climate Change. At a time when the world is moving towards ever more low carbon, renewable energy and decentralized energy production and distribution systems, UK policy has taken a massive step backwards towards the continued subsidization of fossil fuels and other unsustainable electricity production methods. Nonetheless, change is afoot. Despite a sustained assault on the renewable energy industry in the UK, which has seen over 1000 job losses already and threatens 20,000 more, November saw 25 community energy initiatives launch share offers to install around 40MW of locally-owned renewable energy systems across the country. Community Energy is one of the success stories of the Government’s own localization agenda and has largely come about because of the initial efforts of the Transition Towns movement. However, the Conservative administration appears to have taken a direct dislike to the sector, first cutting the Feed-In Tariffs drastically and then, without warning, cutting all access to Enterprise Tax Reliefs for any organisation involved in community energy. The tax incentives, which include Social Investment Tax Relief (SITR), Seed Enterprise Investment Scheme (SEIS) and Enterprise Investment Scheme (EIS) are aimed at encouraging more investors to put their money into small, start-up sectors and social enterprises. The announcement at the end of October was that community energy groups – and only these groups – would be excluded from the reliefs, a direct contradiction to previous announcements. 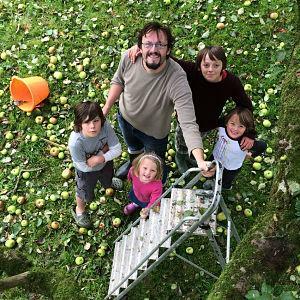 On the back of these further cuts, community energy groups responded in impressive fashion, launching share offers ranging from targets of £70,000 for small-scale hydro up to £5 million pound for solar farms and other ambitious projects. In under a month, the share offers received well over £13 million of investment from tens of thousands of individuals and organisations. The unprecedented success of these share offers was in direct contradiction to the counter-intuitive support being offered to fossil fuels and other largescale technologies by DECC and the Treasury. It also represented a huge groundswell of grassroots support for the sector, with many thousand of those taking part doing so for the first time. Representatives of some of the groups running offers said they had spoken to many who had never invested anything in their life but who were absolutely outraged by current government policy and motivated to invest to “stick two fingers up at the man”. Jan Willem Bode of Mongoose Energy, a co-operative company representing members made up of local energy groups said: “This exceptional rate of investment in community renewable projects shows there is wide-scale support for community energy to be a significant player in the industry in the UK. With it happening within a week of the announced plan to shut coal-fired stations, I think we will look back at this moment and realise this is the beginning of truly locally owned, low carbon power.” The reality is that community energy offers a dangerous alternative to the commercially-driven energy market that currently exists. Community energy is decentralized, locally-controlled and democratic, with organisations being set up as either Co-operatives or Community Benefit Societies, wholly owned by their members and with asset locks in place to stop assets being stripped. These organisations operate for the benefit of their local community and profits are used to create local funds to address energy and sustainability issues, as well as pay interest on investment to members. The overall effect is a big boost to local economies with money staying in the area, rather than disappearing to large multi-nationals and their shareholders. With 1000s of such groups now running up and down the country, the energy industry faces an unprecendented challenge to its control of electricity production and supply. 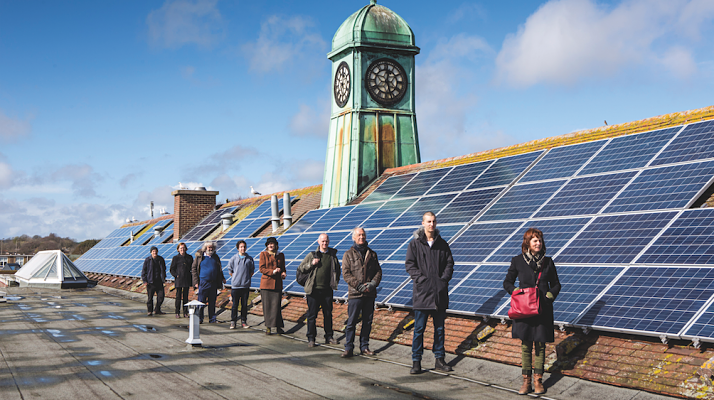 Larger groups, such as Mongoose, are now looking at supplying community-owned renewable energy direct to customers in towns and cities such as Bath and Frome in Somerset, challenging the dominance of the Big Six with local tariffs. At a recent conference run by RegenSW, one of the main lobbying groups in support of community energy, it was demonstrated how the market is changing with more and more customers moving away from the Big Six to smaller suppliers offering disruptive innovations. One of the big challenges for community energy is the need to balance supply up in the local and National Grid. Due to the antiquated technologies involved in this process – and the UKs addiction to centrally controlled infrastructure – the Grid is an outdated system which does an extremely poor job of balancing energy production and needs. New technologies are offering an exciting new route to success for local energy supply, with moves towards smart micro-grids with in-built storage systems, ensuring energy is available 24hrs a day. One future, that even Amber Rudd tacitly admitted was an alternative to the Conservative vision, is the development of a technologically advanced smart grid system where local communities can produce, distribute and supply energy within their own area, ensuring what is produced locally, stays local. This vision offers the cleanest, greenest system available and yet it’s in the hands of the people, once more, to make it happen, with Amber Rudd also stating that she did not see such a move as being the role of Government to initiate. One thing for certain is that we live in an era of change for energy. Across the World, countries are signing up to revolutionary alliances in support of renewable tech. The investment in this sector grows by billions of £s each year. And yet, in the UK, we have a government retreating from innovation in the face of lobbying from the same corporate interests. At this time, it’s more vital than ever that the People continue to insist on an alternative, backing local energy organisations and continuing to disrupt the market with innovative solutions and practical low-carbon technologies! Dan Hurring is a project consultant who works in social enterprise and community energy. He has recently supported several community energy share offers for Avalon (ACE) and Exeter Community Energy (ECOE).